Final Reading Series Installment Next Week! From all of us here at 13th Floor Magazine, we’d like to thank everyone who took time to submit some of their writing and/or art to us. We received nearly 70 submissions of prose, poetry, and various kinds of art, and we couldn’t be more excited to begin the selection process. To those of you who were unable to submit anything for this upcoming issue, we hope to see your work next time there’s a call for submissions. While the semester is undoubtedly growing more hectic each day for everybody, hopefully there will still be time in your schedules next week to see UNO faculty authors Margaret Lukas and Cat Dixon. Both of them are adjunct faculty members of the Writer’s Workshop program and are known for their fiction and poetry, respectively. 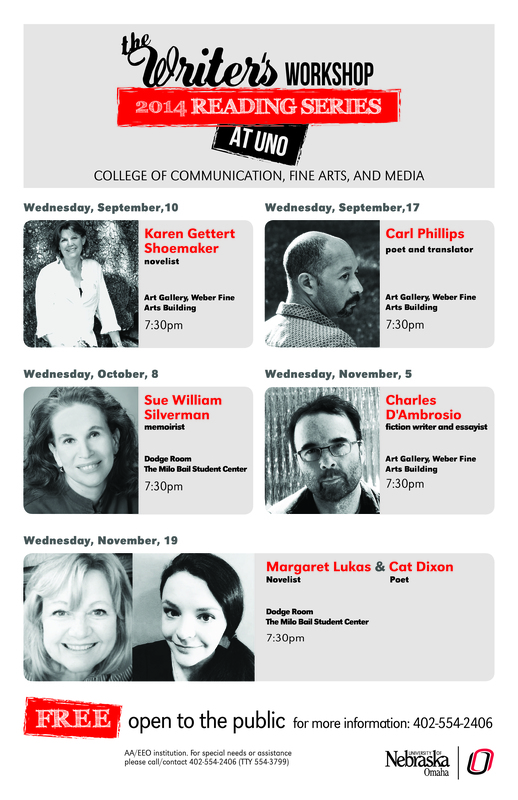 This is the final event of the UNO Writer’s Workshop Fall Reading Series, and like the four previous readings, it should be great. So mark your calendars for Wednesday, November 19th, at 7:30 in the Dodge Room of the Milo Bail Student Center. Best of all, this event is free and open to the public. Two awesome authors for free on the same night? There’s really no reason not to attend! This reading series is presented each fall and is meant to get writers and artists involved in a literary community beyond the UNO campus grounds. Sometimes, that might seem quite overwhelming to those who are apprehensive about what comes after the undergraduate chapter. Having the opportunity to interact with these authors, can help put into perspective what life might be like after obtaining a degree. Fortunately this year, the series has been comprised of readers who are based in and beyond Omaha. If you haven’t made it to any of the other installments of this semester’s series, this one might be exceptionally helpful, given Margaret and Cat are familiar faces for most of us. We hope to see you all there! ← Submission Deadline is Today: Submit by Midnight!